What happens to the poor's hard earned savings when they don't have access to banks? Worldwide, more than 2 billion adults are unbanked. Learn about Five Talents work in mobilizing community savings and creating banks in some of the most difficult places in the world. Across South Sudan, many communities lack access to banks and financial services of any kind. Beginning with a savings group model, Five Talents has helped to establish three community owned banks and branches in South Sudan, serving thousands of residents with access to secure savings, opportunities for business development, and emergency loans. This video highlights the opening of South Sudan Community Bank in Kuajok. Learn more about community savings in South Sudan. Earlier this year, up to half of the population of South Sudan faced extreme food shortages and the possibility of famine. By empowering communities with tools and local resources, Five Talents is equipping entrepreneurs in in the areas where we work to fight hunger. These entrepreneurs are now providing for their families and feeding their communities, building peace and strong communities. Five Talents empowers the poor in South Sudan and developing countries around the world with access to savings groups, financial literacy, mentorship, and business development. This video features an interview from Five Talents Program Coordinator, John Chol, in Juba and footage from Malakal Refugee Savings Groups and the South Sudan Community Bank in Lietnhom: "Our people will not die of hunger again." Support Five Talents' mission to fight poverty, create jobs and transform lives with innovative financial inclusion and training programs. Help us expand our programs to save lives and create opportunities in other areas of South Sudan. Make a donation today! Imagine not being able to read, write, or even spell your own name. This is the plight of millions of women in South Sudan. Learn how Five Talents is equipping women with knowledge and skills not only to read and write, but also to develop and manage successful businesses. Join us on a journey of faith and help empower women and men around the globe. Learn more about what it means to walk alongside families and move from poverty to dignity and self-sufficiency. "I am based in Juba, but my life daily is in the grassroots with the vulnerable women and children." 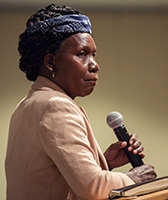 As the Coordinator for Mother's Union, Harriet visits churches and communities across the country to help women provide for their families and become advocates for peace. "According to the culture, women did not go to school and then coupled with the conflicts it has become horrible for women." In South Sudan, 84% of women never attended school and never learned to read and write. By starting with literacy lessons and then financial literacy and business training, Mother's Union and Five Talents have helped over 16,000 women learn to read and write. Bringing women together to learn is the first step towards empowerment. Once they develop basic skills, then they form community savings groups and begin to mobilize local resources for business development. To date more than 13,000 new businesses have been created. Working closely with churches and local communities is key to Five Talents work in South Sudan. As Harriet explained, "When the community does not understand what it is all about, they cannot own it -they cannot accept it." However, when communities are actively involved in leadership, development and implementation, they take ownership and they work hard to protect and develop the programs. This is one reason why community savings has become a key tool for peace building in South Sudan. In a country that has been devastated by hunger and war, Harriet Baka has been a tireless champion for peace and development. Learn more about The Journey of Hope in South Sudan. Thousands of entrepreneurs have been empowered in the ten years since Five Talents began its program in Thika, Kenya. Starting with an initial group of 520 members and $30,000 in savings, today the Thika Community Development Trust has 8,000 clients with $2 million in savings and $4.7 million in revolving loans. Produced by Five Talents UK. Over 2 billion adults around the world are unbanked. Community banks create opportunity and bring stability to vulnerable communities who may otherwise not have access to any financial services. Five Talents helps to establish savings groups and community banks in some of the most remote and marginalized areas of the world. Even the poorest members of a society can own shares in a community bank. In this video, Programs Director, Suzanne Middleton, reflects on the latest community bank in Kuajok, South Sudan. Learn more about how community savings creates economic opportunity for the poor. Five Talents serves over 30,000 members of community savings groups across Burundi. Membership in these groups means access to financial literacy; secure savings; and business, development, and emergency loans. Eighty percent of members are women and most are single mothers who use their savings and business income to provide education, healthcare, and nutritious food for their children. Five Talents is working to spark micro-enterprise development in what, until recently, has been one of the most closed societies in the world. Recent reforms offer hope that Myanmar, formerly known as Burma, is opening up. Five Talents equips entrepreneurs in Myanmar with access to savings groups, small business training and loans. South Sudan is in the midst of a grand transition. Across the country, communities are moving from traditional barter or trade-based economies to a more liquid, money-based economy. As wealth is built, the impact of savings is being felt in some of the more rural communities in South Sudan. Learn more about the origins of Mama Bahati and financial services among the poor in Tanzania. Featuring an interview with Japhet Makau, Mama Bahati CEO. Q&A: What Makes Five Talents' Microfinance Programs So Effective? Five Talents USA Board Member, Jim Oakes, reflects on his involvement with Five Talents during a trip to South Sudan. Learn more about Five Talents innovative work in business training, savings, and loans. Video by Jessi LeMay Photography and Black Label Media Group. Five Talents work in Tanzania was featured in a special documentary exploring the impact of Christian microfinance and financial inclusion on low income communities. Learn more about how you can walk alongside families along the road from poverty to new hope. The savings and loan associations that Five Talents has helped to set up in South Sudan are preparing the way for a whole new generation.